Summer is in full swing with camps, visiting family and trying to keep the kids busy. It is a wonder we get anything done! Well take a little time to yourself this summer we all need to refresh once in a while. Our latest family trip to Montana was my refresher. Now to get those pics in an album! We now offer ADULT ART classes, come for one or all, but call the store to sign up first. Our kid's summer camp is in full swing, we still have room in August. It will be our most intenstive art class yet. Don't forget! you have until July 30th to fill your 30% off bag come in today. We have 10 passports left, fyi you would only have to spend $35 dollars total to have the passport pay for itself. Plus you get free admission to the ScrapExpo. SIZZLIN' SUMMER Paper Chase Passports are in if you have pre-purchased come in to pick up, if you haven't get yours today! it is you ticket to 15% off 17 GREAT stores!!! plus prizes, free 8x8 make n take at each store you visit! Don't miss out scroll down! Make your own Sale, Sale! or the 30 for 30 Sale! Ok the name is lame but the sale is not! Come in from now until June 15th and spend $30 or more, and receive a special sale bag. That bag can be brought back to the store anytime during the entire month of July and filled with goodies for 30% off! Why did we do this? well first who doesn't want 30% off :) but really let's face it school is out soon and as much as we like to think things will be slower for us summer is short! SO this way you can come in and make your own private sale day! Bring some friends or better yet schedule a crop night and get 30% all night! PS we have some great new pretties in the store right now so come in soon! I wanted to let everyone know that there are a few spots left in our two classes this Saturday, May 31st. AT 10:30am, we have the Family Album Wall Hanging with Nancie. 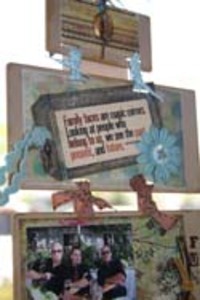 This is a beautiful 5-tiered wood wall hanging that has beautiful embellishments, papers and quotes. Come join Nancie for this wonderful keepsake or present for a loved one. At 1:30, its "Angelique" with Lisa. 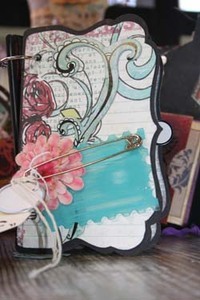 Lisa has used the Cosmo Cricket Blackboard Abby Album, along with prima papers, beautiful chipboard and embellishments. Both classes are going to be a ton of fun, come join either or both classes for a fun filled day with Nancie and Lisa. Call the store today to sign up! 925-952-4437. 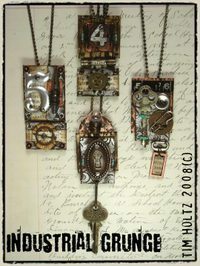 Tim Holtz Sign ups are coming! Sign ups will begin Friday! You may call the store or better yet sign up online. A paypal store will be visible Thursday at Midnight! Here are the class descriptions if you have any questions or need help picking please call the store and we can help find the right class for you. 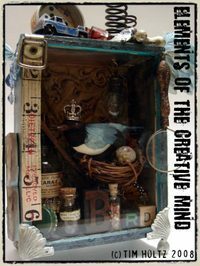 Do not miss this opportunity to create something unique and beautiful. Intimidation does not apply! Ladies who have had to pleasure of taking a Tim class before comment on this post! Encourage your fellow artists to join in! 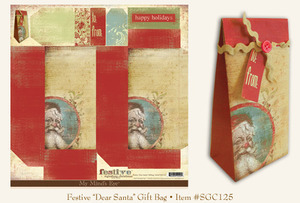 We will draw for winner of a signed Tim Holtz Canvas bag and a set of his ATC stamps! You have until June 7th. Cosmo Cricket all three lines! Carol Wingert Classes are online. Check our new Artiste Blog or Calendar for full details. Everyday we will be receiving new product we suggest the next few weeks to subscribe to our blog for the daily report of new stuff! Also we have a wonderful art program starting for children 1st thru 5th grade on Mondays and Fridays We have about 3 spots in each session left. I have adding her bio and full details to our blog on the left side. Sierra will be taking the Friday Session :) Click here for more info. Monday is just about sold out but Friday we have 5 or 6 seats left! This just in.....MDW will be at EXPO!!! 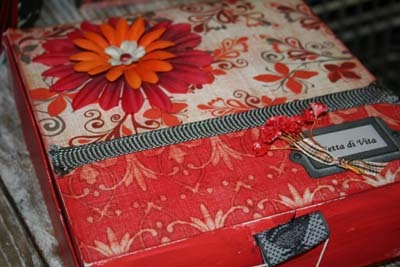 We have a class on friday night I will have preveiws tomorrow on the blog so check it out! More NEW 7 Gypsies is in stock now! Click here to check it out. Plus Cosmo Cricket just walked in the door I gotta get busy entering it! Come play with Nancy her classes are always so fun! we love her!!!! Her Slices of Life is an interactive project that will open "doors" to the land of creativity. 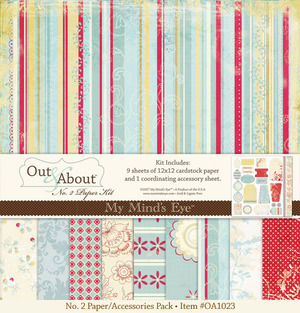 The techniques you learn in this class will translate to the traditional scrapbook page and beyond. New or advanced this class is a great "ground breaker"
LAST BIG NEWS I have Previews and prices of Carol Wingert's Classes check our blog tomorrow for sign up info!!!!! Special discounts throughout the store! Further discounts with special bargin areas of up to 50% off! If you want a hard copy of the schedule here it is! tons of yummy stuff just walked in the door! My Mind's Eye, Ranger, Making Memories wow super cute! Basic Grey's Figgy Pudding is on a brown truck on it's way so hopefully monday or tuesday! REMEMBER 10% UNTIL THURSDAY 25TH. Our store website is down right now but will be up very shortly. I will extend the sale online once we are back up and running. Thanks! We just had a fabulous meeting with our new design team and I can't wait to share our new class schedule! We will have dates and times up shortly with pictures coming by the end of the month. Allison Kreft from Hambly studios is coming to the store November 6th at 6:30 pm to teach a super darling clear mini book. I will post a photo soon as well. 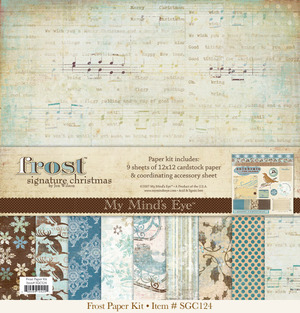 7 gypsies new PAPER and Metal Edges!! !